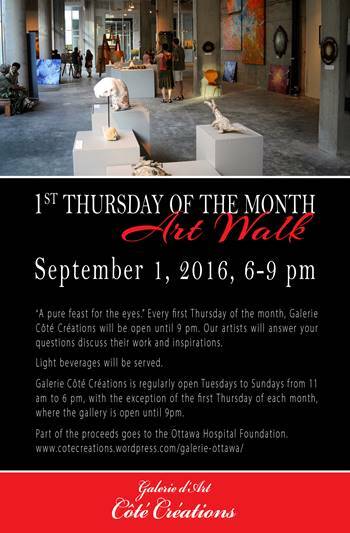 Thursdays night, starting September 1, from 6-9 pm at Galerie Côté Créations . Most of the artists will be on hand to talk to about their work/inspiration. … NCNS member Géraldine Petit-Gras is an artist, and curator of Galerie Côté Créations. This entry was posted in Exhibition Opportunities and tagged Art Walk, Galerie Côté Créations, Géraldine Petit-Gras. Bookmark the permalink.